The IBM Tealeaf CX platform is a Customer Experience Management (CEM) solution that captures your customers’ website interactions, giving you unprecedented visibility into their online experience, and the ability to optimize your website. In simple terms, IBM Tealeaf’s web analytics capabilities tells you what your customer is doing on your website, and why they are doing it…all in real time. Whether your customer is using a desktop or mobile device, Tealeaf analyzes all their interactions on your website. Regarding mobile users, it optimizes your customer’s mobile channel experience, and provides you with complete mobile visibility. Tealeaf also equips your customer service team, or call center, with the tools needed to seamlessly respond to customer issues and offer accurate and practical assistance quickly. Optimize the value of all the web and mobile traffic to your website. Ensure more customer’s transactions are successfully completed. Prompt visibility into customer struggle without interrupting customer behavior or site performance with tagging. Build your reputation for providing a positive customer experience. Customer service effectiveness due to immediate access to online customer sessions. Archive records of customer experiences to investigate any disputes. Quickly fix customer obstacles or system errors. Lower production costs due to less amount of time spent finding and resolving those errors. Real-time data processing. Filtering and manipulation functions to track and protect the data for your analysis. Reliable, secure, and private architecture. System resources are safe and responsive regardless of the size of your data volumes or rigidness of your requirements. Flexible and scalable platform. Fulfills site traffic growth requirements in a unified view of captured data. Intelligent data management. Customer sessions are archived and compressed to reduce storage requirements. Flexible archiving. Stores customer experience data for future problem investigation and resolution use to prevent customer struggle. Seamless integration. No need to adopt any new processes into your current procedures. 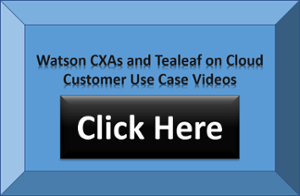 Tealeaf CX: Base platform serves as the engine for all IBM Tealeaf ExperienceOne products. cxImpact: Transforms data into searchable and replayable customer sessions to solve hidden issues of customer struggle. cxView: Offers a proactive warning system to alert you of significant changes in crucial customer behavior. cxOverstat: Optimizes the page flow of your website through visual analytics to identify the areas of customer struggle. cxReveal: Accesses live and historical customer interactions through session replay and search functions. cxVerify: Stores permanent records of customer actions for future reference for audits, fraud investigations or customer disputes. cxMobile: Applies the power of Tealeaf solutions to capture the interactions of customers using mobile devices. cxLifecycle: Uses qualitative and quantitative data to improve the customer experience across the entire buying cycle. Data Analytics: Creates a multi-channel view of customer interactions to integrate Tealeaf with business intelligence or reporting applications. Web Analytics: Integrates Tealeaf with web analytics applications to reveal customer trends. Voice of Customer: Allows integration with VOC technology to collect, analyze, and provide context around customer feedback. 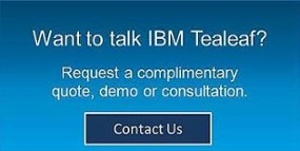 Would you like to talk to us about IBM Tealeaf? Please click on the Contact Us button on the right.